On a recent beer run, I had the fortune of spotting a bottle of the newly released collaboration beer from Sierra Nevada of California and Dogfish Head Craft Brewery of Delaware called Life and Limb. This beer's hype had preceded itself before I found the bottle and I couldn't pass up the chance to sample one. I'm a big fan of most things from Dogfish Head and Sierra Nevada and when I heard from my fellow beer friends like Ashley the Beer Wench and Taylor (@TheArtofBeer) that they had sampled some of this American Strong Ale and enjoyed it. Apparently it was a hit at the San Diego Beer Week. I simply had to try some. Life and Limb was made with two different kinds of tree syrup. One was maple syrup from Massachusetts and the other was birch syrup from Alaska. Sam Calagione's family owns the farm where the maple syrup was made so it makes this a more personal brew for him. With all of this thick syrup in the batch, I wondered just how sweet this beer would end up. In addition, Sierra Nevada put in 2-row pale malt along with some Chocolate and Carafa malts (both dark and roasty). The brew was bittered with Bravo hops for bitterness and Sterling and Perle hops for flavor and aroma and gave the brew a 50 IBU bitterness rating. Appearance: Contrary to other reports, this beer doesn't pour black. It's certainly dark but I could see half-way through this beer. It had plenty of mahogany edges around the sides of the glass. The foam built up rather quickly and actually overflowed my glass when I was pouring. I had to let the foam settle down a bit before it could fill the glass. The head itself was a light tan color and when swirled left a very nice lacing that seemed to coat most of the glass. There was a load hiss when opened. 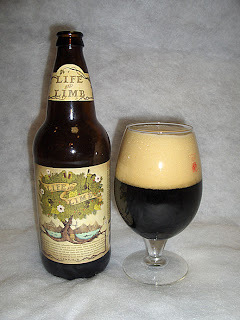 Life and Limb was bottle conditioned with the birch syrup so that the yeast inside had plenty to eat. Aroma: I could definitely pick up on the maple syrup in the nose right away. It also had a noticeable scent of alcohol as it should since it weighs in at 10.2% ABV. It reminded me a bit of a Barleywine. Along with the sweetness in the aroma I could pick out a slight roastiness from the dark malts and a touch of spice from the hops. Mouthfeel: Almost instantly, Life and Limb covered my mouth with a creamy sensation. The brew was rather smooth going down as well. I got a nice coating across my tongue that lingered. There was a bit of dryness that came in mid-palate. Life and Limb wasn't as carbonated as I thought it was, but it was far from being flat. I got a slight bitter finish at the end as well. Taste: My first reaction was that Life and Limb was a high octane version of a brown ale. It wasn't as roasty as the beer might indicate. The sweet syrup was noticeable throughout along with a slight alcohol bite. I could also pick up on the spiciness that the hops added to this beer as well. Still, I felt it was a bit on the sweet side at first. But as I always recommend, I had to keep sampling this beer in order to bring out the true character of the beer. All too often, a beer is judged completely with only an ounce or two of sampling. With this beer, you need to have at least 6oz or more in order to truly appreciate it's complexity. The sampling quickly evolved from a sweet and mildly spicy beer to a smooth and creamy Yum! The dark malts are mixed well with the syrup as to hide some of the dark roastiness. The syrup levels were done just about right. They stopped just shy of having a bit too much sweetness in the brew. Overall: At first, I thought Life and Limb was going to be like an un-aged Barleywine. It was strong and potent up front but soon mellowed out into a very smooth and slow drinker. It was very warming - perfect for a snowy winter night. Supposedly, this beer was designed to age for many years. I might just pick up another bottle or two and put it away for a few years. I hope they decide to make this beer again as it would be interesting to do a vertical tasting of this down the road. One of these in a night is plenty. It comes in a large 24oz bottle. - Dogfish Head World Wide Stout review. - Dogfish Head Festina Peche review. - Dogfish Head 90 Minute Imperial IPA review.